… which is why yesterday’s publication of ‘Paragons of Fey Valour’ by Claudio Pozas caught my eye. The article presents 3 paragon paths linked to the Feywild. Normally, I have to admit, paragon path articles tend to leave me a bit cold, and are quickly browsed at best. As I’ve posted before, in my opinion, there is already far too much 4E player content around! However, I found this a great article. 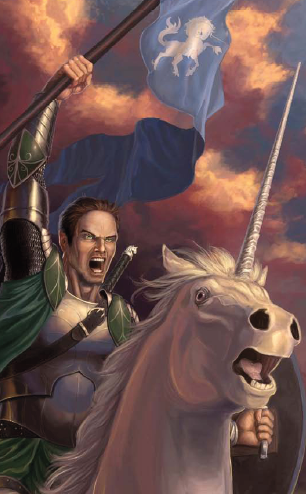 The first path, ‘White Horn Knight’ has great possibilites for my campaign, and matched my PC’s interests, so that obviously helps, but what I really liked was that the paths had really clear story and adventure hooks, and powers that really support the flavour of the path. All three paths generated ideas that even if they do not suit my PCs when they reach the Paragon Tier, will be useful to me as a DM as adventure hooks, or flavoursome powers for my villains!! Claudio is one of the designers of Player’s Option: Heroes of the Feywild, so if this article is representative of the content of the book, I can’t wait for my copy to arrive (very soon now…)! This entry was posted in 4E D&D, Columns, Reviews, Roleplaying with Kids, Wizards Watch. Bookmark the permalink.